What a kerfuffle occurred recently concerning how much the House of Commons has spent – £250,000 in 20 years no less – on portraits of its more distinguished and long-serving members. How shocking and self-indulgent was the general tenor of the response. Well, no actually. To get two dozen paintings for 250 grand suggests someone is driving a hard bargain on our behalf for once. What we have received for our money is generally accomplished if predictable, and dirt cheap. Don’t forget that the Tate recently paid half this total sum for a certificate which allows them to have a light being switched on and off in an empty gallery. To get a portrait by Stuart Pearson Wright for ten grand is a good investment, if nothing else. His account of ship-of-state Diane Abbott (above) is at least a painting not a photograph by an original artist. Likewise Phil Hale’s version of Blair (top right). These two painters are among our most interesting oddities in painting. Eschewing the obvious, they surprise and are of quirky, unpredictable intelligence. Look at Hale’s account of that slippery wretch Blair. As a character study of failure it’s as good as you’ll get. This is a picture of weakness, of a person cringing inside with pain and wrestling with an appalling legacy of foreign crimes, not to mention his fiddling in No 10 while his neighbour-from-hell bankrupted the country. Which picture would you prefer to be in the National Portrait Gallery, Hales’ or Adams’ (see opposite)? The Arts Council gets away with wasting tens of millions on white elephant buildings and no newspaper bats an eyelid, while this collection of portraits for a mere quarter of a million is slaughtered. 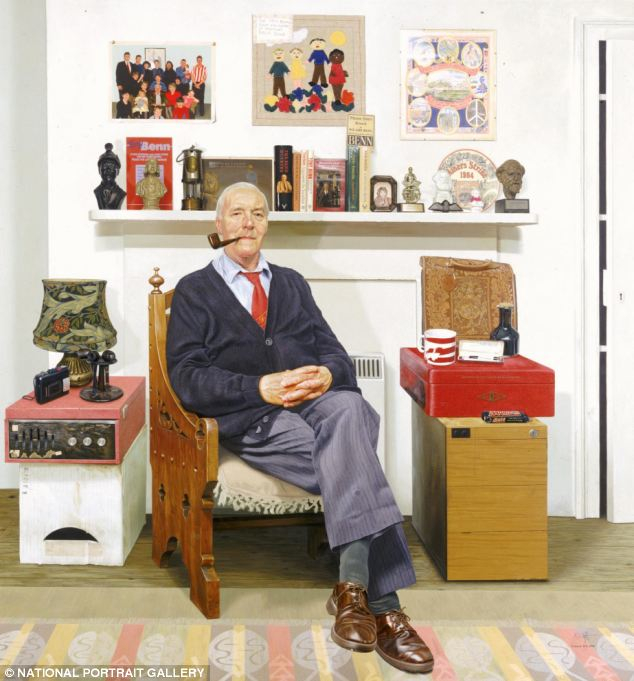 Andrew Tiff’s photorealistic portrait of Tony Benn, which has long been on display in the NPG, cost a mere £2,000. What do these jerks in the dailies expect to pay for an oil painting? If anyone is worthy of a portrait it’s Benn, and to get a painting for the price of a photograph is deft business. The commissioners should in all honesty have offered Tiff more. We should all be celebrating the fact that skilful artists have been prepared to work for not very much.